Twin 25 mm KBD guns of a Myriad mounting, showing the dual ammunition feeds. Sketch copyrighted by OTO-Melara. This CIWS is a result of a collaboration between OTOBreda (now OTO-Melara), Oerlikon Contraves Italiana, Elsag and Selenia. It uses a pair of Oerlikon 7-barrel KBD Gatling guns. 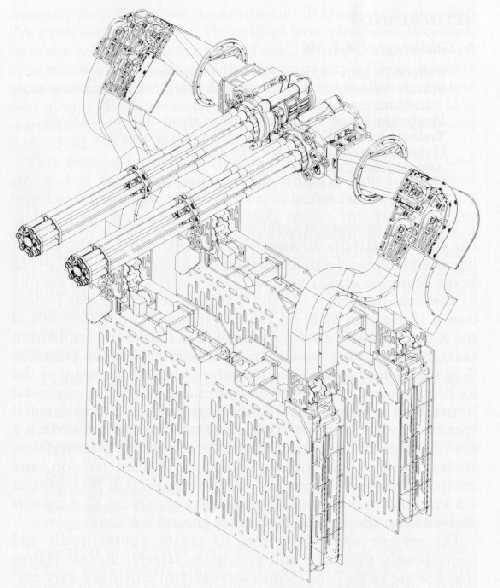 This is the first Gatling-type gun ever developed by Oerlikon. The design concept behind the Myriad is that, no matter how fast or how maneuverable an anti-ship missile may be, it must attack a ship through a small range of possibilities. The FCS, built by Elsag, uses known aerodynamic features of missiles in order to predict the where the missile must be located when it gets to within 500 to 1,000 meters of the ship. The very high ROF of this twin mounting then saturates this location. As far as I have been able to determine, this weapon did not enter service use. These guns have a patented anti-hangfire mechanism to prevent the guns from firing unless the breach is locked closed. ^HE-I self-destructs after about nine seconds flight. ^APDS-T penetrates 1.33 inches (34 mm) of armor plate at a 60 degrees impact angle at 1,100 yards (1,000 m). The original mounting was on a tilted platform so that it can engage zenith attacks. The current mounting is a low-RCS that rotates on a horizontal plane. The mounting carries 2,000 rounds of ready ammunition in four boxes. These can be of two different types, if desired.